Tomorrow is the day! The People will have their opportunity to influence the conversation we are having about transportation in the city of Omaha. Join us at the Scott Conference Center at 6:30 p.m. If you would like to use alternative transportation to arrive, we have organized four bike rides and Metro will have a special bus. Today’s graphic is Omaha specific, and speaks to the relationship of transportation to other civic issues like zoning and development. Population density (and proximity of residential and commercial space) have a profound affect on transportation infrastructure and transportation choice. 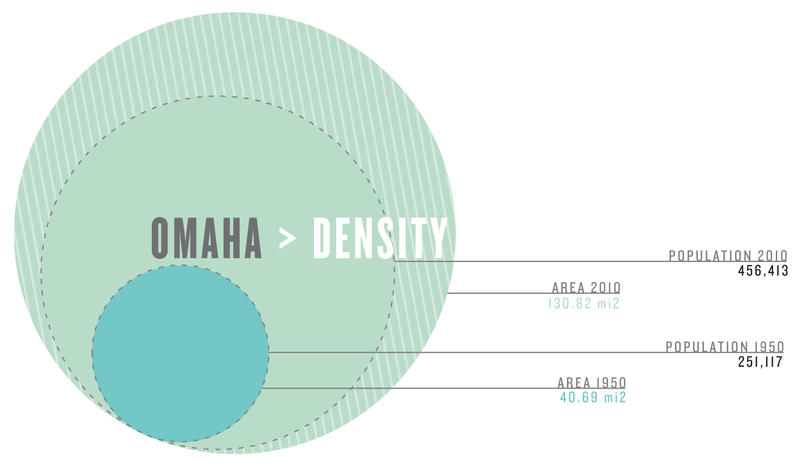 The graphic above compares the population densities of Omaha in 1950 and 2010. In 1950, Omaha had a population density of around 6170 residents per square-mile. You can see in the graphic, in the intervening sixty years, the population nearly doubled. The area however, more than tripled. The 2010 density of Omaha was about 3500 residents per square-mile. So what does that mean for transportation? As people spread out, and live in areas with lower population density, we need more roads (and more sewers and longer electricity and gas transmission lines). The basic infrastructure of the community becomes more expensive. Also, the distance not only grows between neighbors, but between residences and businesses. Public transportation loses efficiency, and people do not feel they are able to walk or ride a bike to the distant goods and services they want to access. As the costs of infrastructure increase, certain elements, such as sidewalks, are eliminated. Eventually, a community emerges that demands ownership and use of the private motor vehicle to the exclusion of other modes of transportation. The choice to live in the area of lower density means your transportation options are limited. When a city allows the community to become one with limited choices, the government is essentially forcing you to own and operate a vehicle or be excluded from the opportunity to participate in commerce, recreation and employment. So, when we say we want to have a community in which we all have options, we are also saying we support efforts to encourage in-fill development as a fiscally responsible approach to civic development. Greater density will give everyone more options in how they live. The suburban developments of the 20th century will still exist, but looking to the future, we need to focus inward and start increasing our over-all density. good summary. The key transportation issue for me is the economics of the whole thing. The system we have now is that one that a rich nation with cheap energy can afford. What happens if conditions change? If there is no viable Plan B, it will be a hard landing and uncomfortable adjustments will have to be made. Also, a dense city provides amenities that a sprawling one does not. No matter what the cost of fuel is. Many folks who live in suburbs don’t really have a choice but to own a car since everything is so spread out and it can take several miles just to get to the story. Having choices is a good idea but I don’t know if the money is in place to make it happen. Finances at the federal and state levels aren’t the healthiest right now.